We stopped on the way for a breakfast near Malvan. “What’s in there for a breakfast?”, I asked the shopkeeper; he replied fluently “Fafda, Thepla, Dhokla etc…”. Well, the names did sound like missiles at first, but they were all delicious and yummy foodstuff. On 15 Aug, 2016, the state government exempted small passenger vehicles and state-run buses from paying the road levy on 12 state highways in Gujarat. Great News!! When I was taking my micro-sleep, Harsh called me up to witness this sight- a flock of birds flying from east to west and setting some major friendship goals for us. 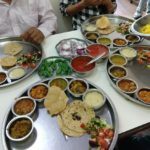 The first thing as per the plan was to have lunch at OSHO near Mandvi. Harsh opened the google map but all his efforts went in vain. We got stuck amid the narrow lanes and busy marketplace. Everybody was staring angrily at me for having suggested this place. I composed myself and with the help of locals, we eventually found the place. The Hotel was on the first floor and looked fairly ordinary and simple from inside. 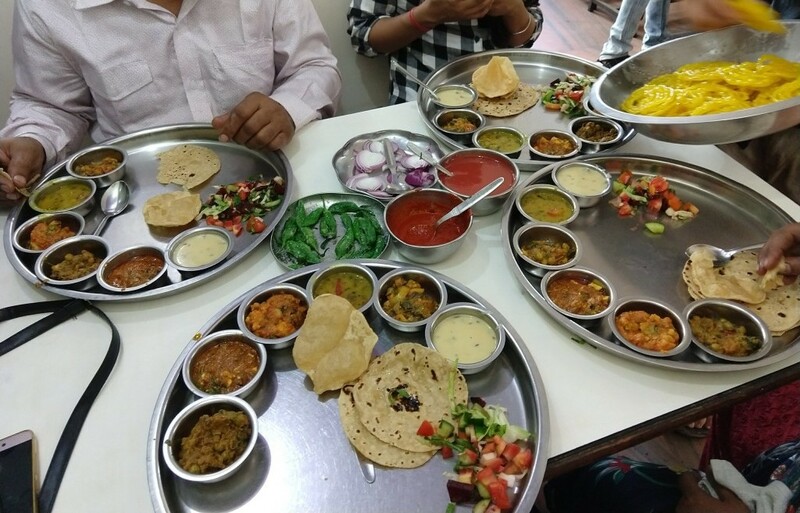 It was only Thali system over there wherein every thali cost 130 per person. No sooner did we place our order than the staff started serving us as if we were Kings! I mean it, literally! Starting from Sabjis, Papad, Chutneys(2G, 3G, and 4G; the higher the number, the spicier it gets), Puri, Rice, Salad, Chaach(Buttermilk) and at last the Jalebis. Slurp!! 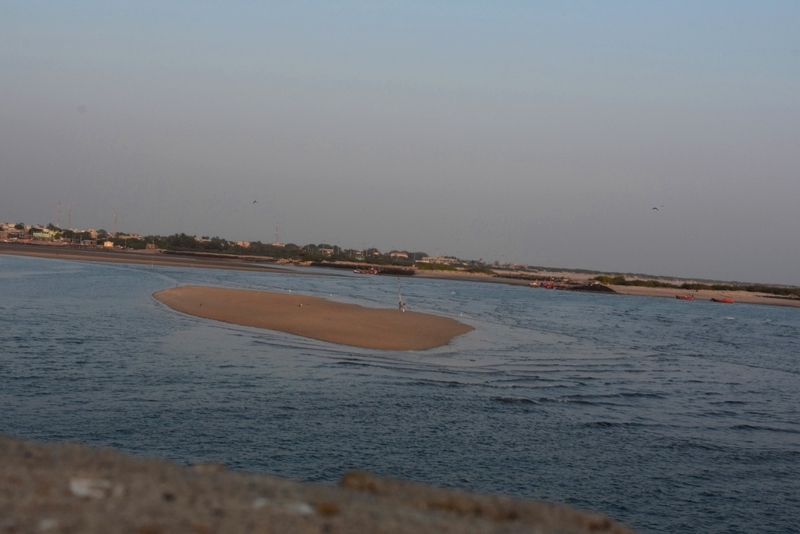 We went straight to Mandvi after having the extravagant lunch at Osho. 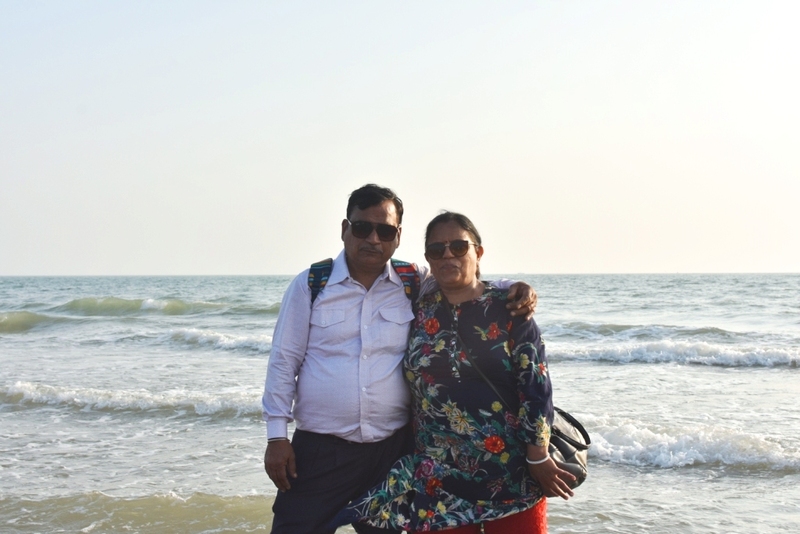 Seeing a beach after a long time was fun for me but the happiness on my parent’s face was beyond measure- similar to the delight that kids express when offered their favorite candy. Harsh looked all charged up after seeing a beach and this jump into the air is a sheer proof. Then I saw this place, beyond the walls, which looked even more beautiful. I overheard the people around saying ‘That’s Pakistan’ and I couldn’t help laughing out loud. I clicked some pictures balancing myself and camera over the wall and fortunately, the efforts paid off!! Dad and Harsh repeated the same steps and appreciated the beauty beyond the walls. We held each other’s hand and enjoyed the tides approaching us while the sun was packing up his sunshine and warmth. Every one of a hundred thousand cities in the world had its own special sunset and it was worth going there, just once, if only to see the sun go down! Dusk crept up the canyon with a tinge of red all around. It was really the sight to behold! 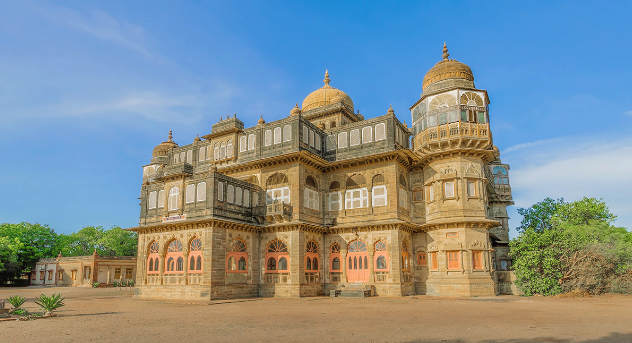 It was barely at a distance of 15 km from Mandvi beach and the place has inspired popular Bollywood films like Hum Dil De Chuke Sanam and Lagaan which were shot at this palace. My verdict: You can choose to stay in the luxury tents off the private beach of the Palace for some peace and quiet. I noticed this grand building on our way back to the hotel( Park view Residency). I insisted driver uncle to stop the car for a while. Everybody agreed! 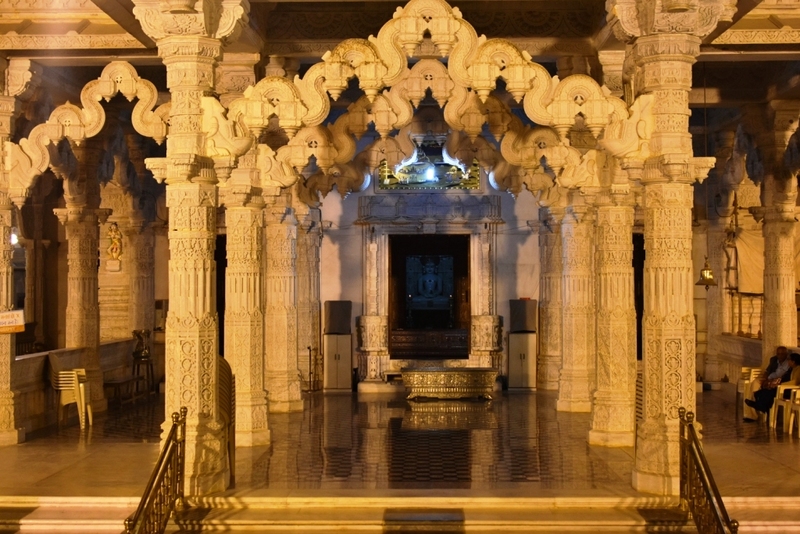 As we entered the premises, I was not able to take my eyes off of the beautiful, intricate and detailed work. The place was breathtakingly beautiful! We definitely do not have such grand temples in the north of India. At a distance of around 11 km from Mandvi, this place is a wonder for architecturers and art lovers. 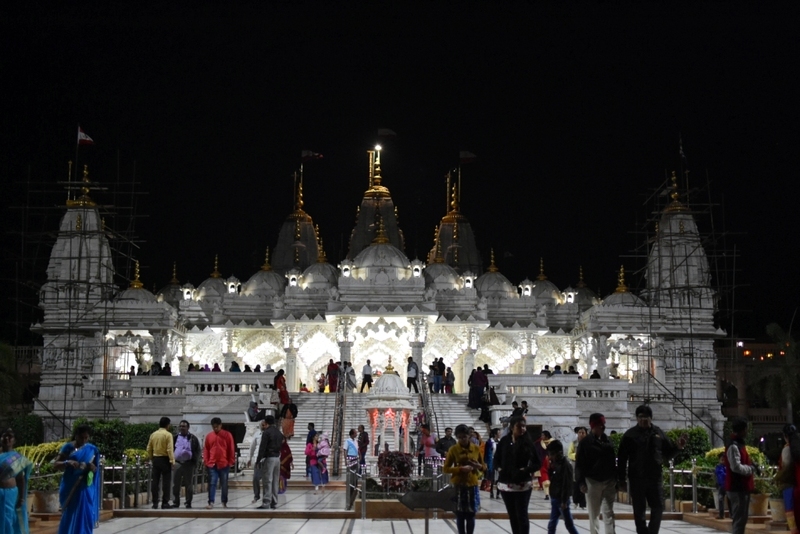 Driver Uncle introduced us to this place and I got stunned after looking at the intricately carved marble pillars of 72 little domes encircling the main temple. 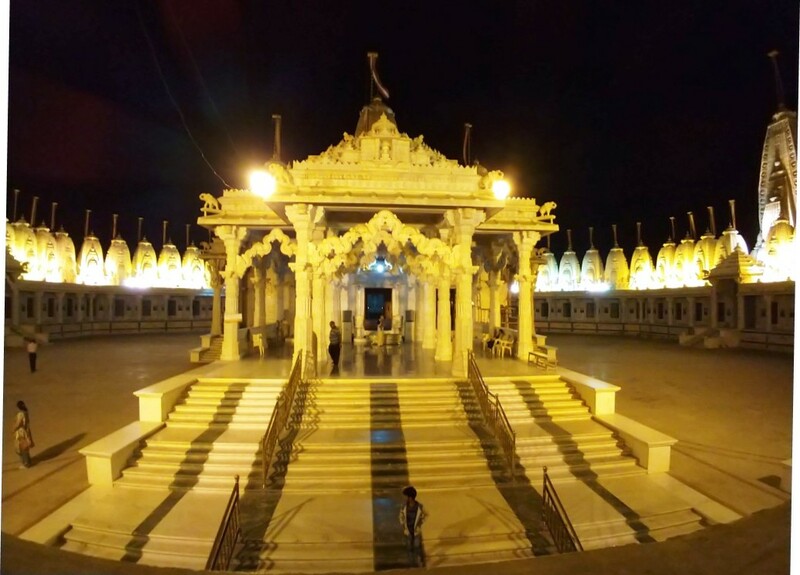 My Verdict: This is a must visit place for all the Jain community members since they will be able to appreciate the manifestation of different forms of God. Best Time: The best time to visit this place is in the evening when you can enjoy the sunset. Water Sports: The place is a smorgasbord of various water sports like ocean swimming, parasailing, and banana boat ride. Other adventure sports here include quad biking, zorbing, dirt biking, horse rides and camel rides. Snacks: Be sure to try the Dabeli, because Mandvi is its birthplace. 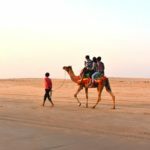 Culture: The town has a quintessential Kutchi culture and people here turned out to be one of the most hospitable communities I’ve ever come across in India. The Wind Farms Beach: Asia’s first Wind Mills Project running on the beach, founded in 1983. 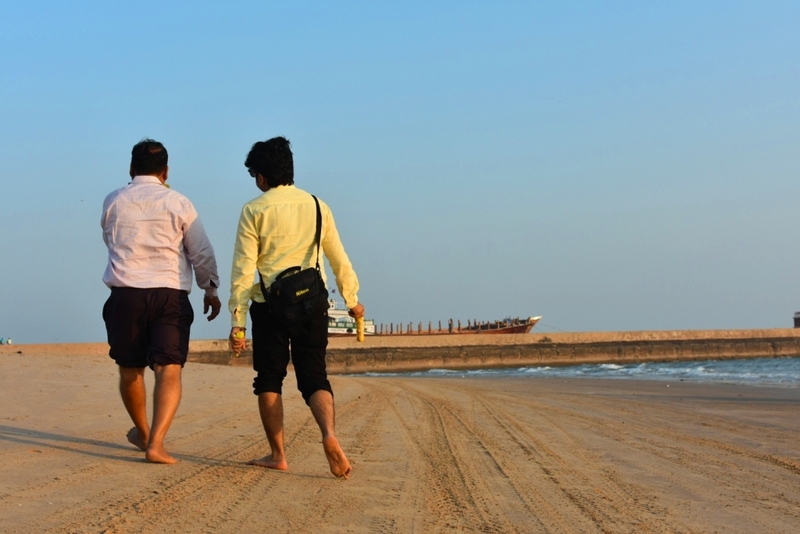 It lines the horizon of Mandvi and offers a spectacular view from the beach. Bandhni Bazaar: Mandvi is known for the production of its famous Bandhani(tie-dye) and other country crafts. 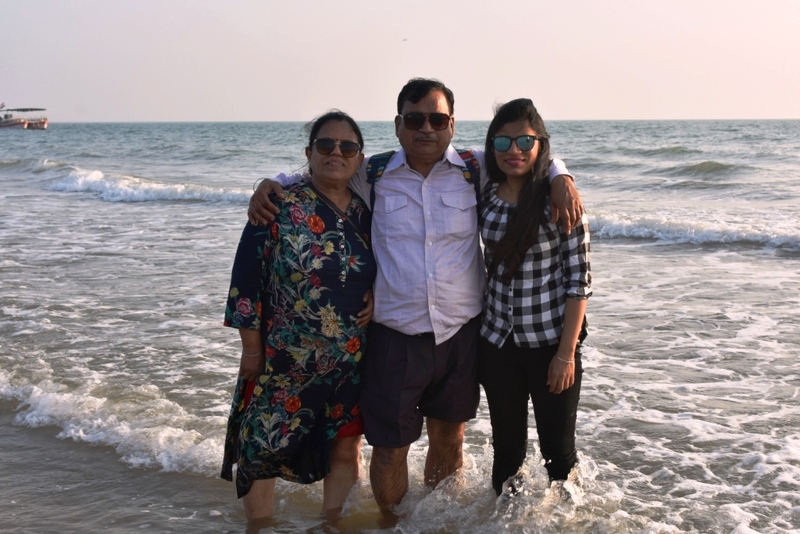 This trip was like an enchanting rendezvous of the cultural history and the serene beaches. So, pack your bags and check out what this place has in store for you! 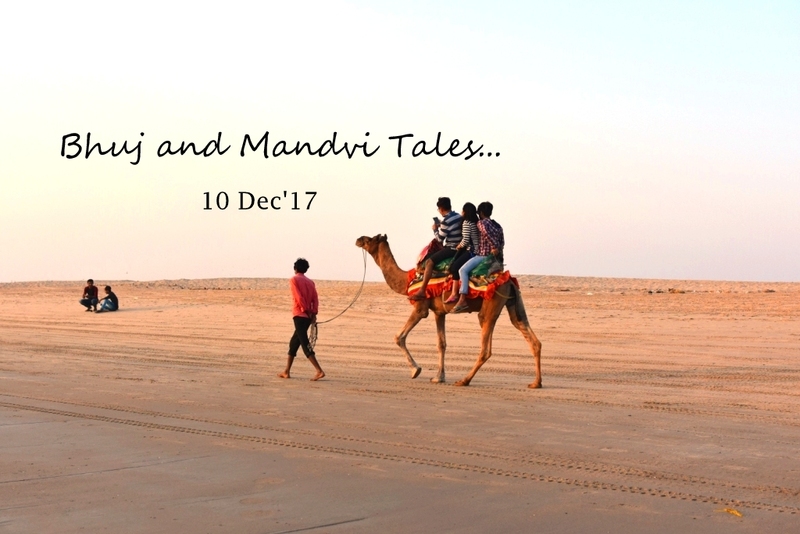 Have you been to Mandvi? Are you still planning on it? Let us know by leaving a comment below! Follow and Subscribe to get my upcoming travel posts delivered to your inbox. 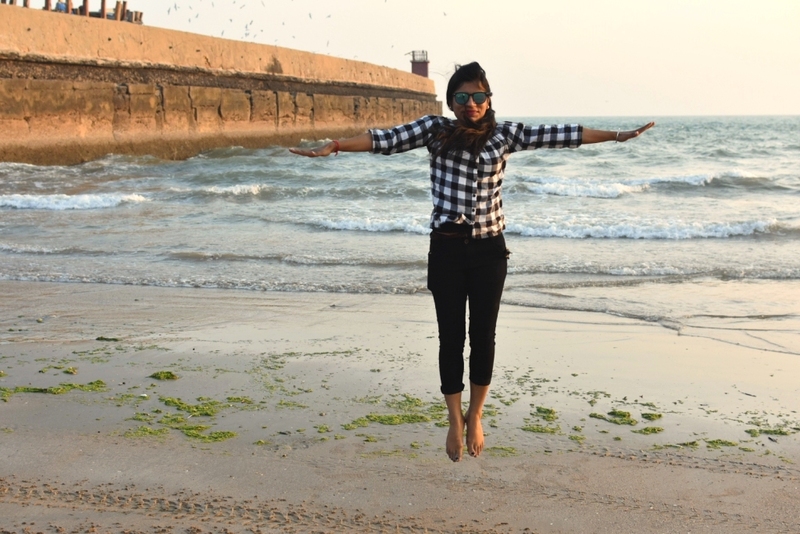 Stay tuned for the posts on Runn of Kutch, Dwarka, Somnath, Gir, and Diu! Thanks, Umang for being regular reader of my blog posts 🙂 I really appreciate it! P.S. There’s a typo in the cover picture.. Shouldn’t it be Dec ’17? PS: I am aware of that typo 😉 but didn’t get time to correct it. Will update it soon and thanks for pointing it out. Stay tuned to diextr for upcoming posts on Runn of Kutch, Dwarka, Somnath and Gir, and Diu. Thanks, Manish. I am glad you liked the content. 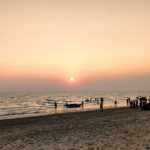 Stay tuned for more travel posts on Gujarat! 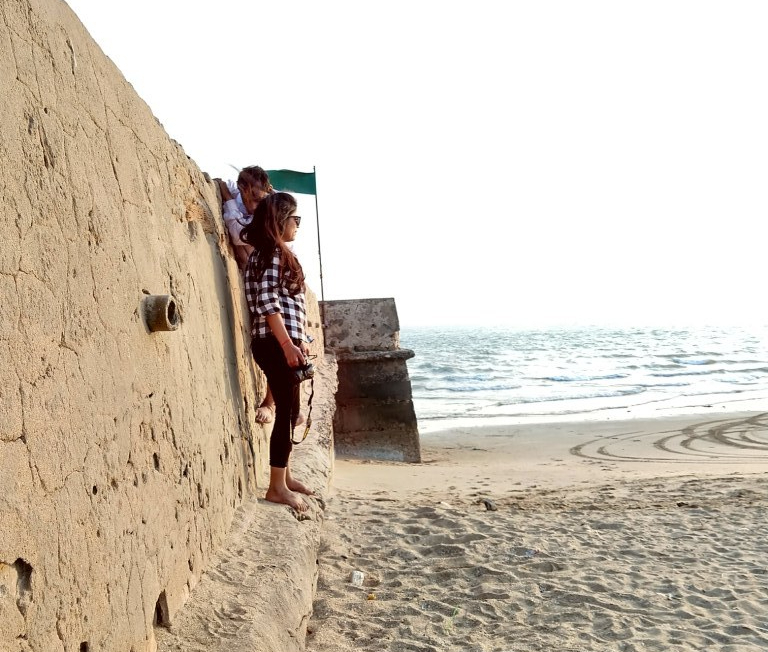 mandvi beach and the osho restaurant is the one of my favorite places . That’s great!! Stay tuned for more travel posts on Gujarat circuit!! I thought dabeli is from Maharashtra but was shocked to read it’s origin as Mandvi. Yeah, the origin is Mandvi. and Dabeli in Kutch is different and better than that available in other places in India. So, do give it a try when you go there. Yeah, Indeed! it was memorable for me too.